Problem: Currently I am using Outlook and there is an email in my mailbox and when I am trying to click on that email, Microsoft Outlook gets crashed. I am not able to delete this email. Why, this corrupt email crashes Outlook? Can somebody help me to overcome with this issue? Solution: Microsoft Outlook consists some emails which when accessed, may crash Outlook.The major problem with such types of corrupt email is that we cannot delete such message, whenever user tries to access this email, Outlook crashes instantly. Before discussing this topic, firstly we should discuss what’s the reason behind corrupt OST/PST email? If system or application is improperly shut down, then emails are prone to get corrupted. If there is fault within routers, gateway, etc then email get corrupted. If OST/PST emails may not be properly matched with the pre existing folders of it. You can delete that corrupt email without crashing Microsoft Outlook if you disable the reading pane from Outlook. 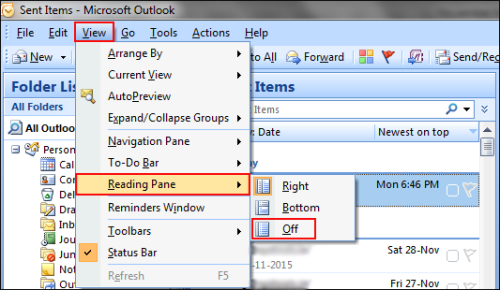 See the below sections of this blog to understand how to disable the reading pane in different versions of Microsoft Outlook. Start “Microsoft Outlook” >> Click on “View” tab >> Under “Layout” group, click on “Reading Pane” and hit on “Off”. If corrupt email is the first email in Outlook’s inbox and startup folder of Outlook to the inbox then we will not able to disable the reading pane. This scenario will demand us to open Outlook in safe mode. 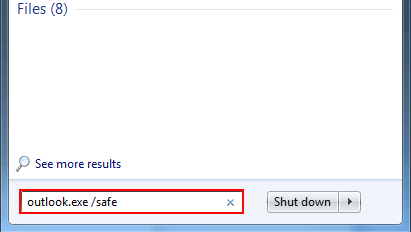 Once you will start Outlook in safe mode, it will initiate Outlook with the turned off Reading Pane. If you have implemented all procedures as mentioned above and still corrupted email crashes Outlook, then it means that the OST/PST file of Outlook is damaged. You need to repair OST/PST file using Inbox Repair tool (free utility provided by Microsoft).